Depending on the product, up to £17. Ball park 50% increase then. Ouch - wonder what reason they are peddling for this. Better start searching for stuff I want. Not necessarily, the lowest is £4 and I'm at a complete loss as to the logic with which Shapeways had applied these increases as it isn't applied as you think. For me, this is the final nail, I'm now certain I'm not doing any further development on the Shapeways range in the future. Sorry, to clarify, the lowest increase is £4. OK, the prices increases work out to be between roughly 30% and 200%. Unfortunately, even adjusting my own mark-ups to zero still wouldn't get anywhere near close to combating any of the price increases in the Atso-Cad Shapeways range. As I've indicated before, I'm not in the best of places right now and really am in no position to look into this further at the moment. I feel for Atso sustaining this latest blow. The Shapeways price increases were announced back in October, but will only be implemented from the beginning of February. Today they have provided a spreadsheet analysing the price changes for existing items. I only have one item in my Shapeways shop, and the increase varies from 3% to 22% depending on material. It is the adapter I use to motorise the Oxford Diecast Borismaster bus, and the cheapest material is actually the best in my experience. The 3% increase from Shapeways is less significant than the monthly price variations caused by translating USD/EUR to GBP at Shapeways exchange rates. I feel for Steve in all of this as well. I have had my own problems for quite some time, as Tank is aware, and can echo the wonder with which Shapeways seem to be doing things. I thought my increases were bad enough at 113% in several cases. I wonder how long it will take for a rival to Shapeways to be Venture Capital funded (as Shapeways is). A new entrant can learn from Shapeways mistakes and will have an understanding of what will be commercially successful. I just ran one of my complicated 3D designs that I know the price of through Shapeways through Sculpteo and the equivalent price looks in line with the new Shapeways pricing. this indicates the pricing may be being driven by material costs. Sculpteo is a US and France based production house but do not have a shop. If I dig further and come up with anything significant on where to get cheaper prints I will create a new thread. I am sorry to hear of your travails and wish you all the best for both a good personal recovery from your health issues, and then a successful return to the hobby when you're ready. I have only ever heard good things about your models and service. To say that I was disappointed to hear your recent announcement is an understatement! However, I do understand that good health and financial security are very important in one’s life and must take priority over other things. I consider myself to be a (very) “average” modeler and my main interests are fiddling about with locomotives and rolling stock. However, scratch-building stock in n-gauge to the standard that would satisfy me is beyond my capabilities. Consequently, 3D prints provide me with a great starting point for unusual models that are not (and may never be) available ready-to-run. I have a double track, continuous run layout based in the north-east of England during the period 1950 to 1970 that enables me to run my stock. 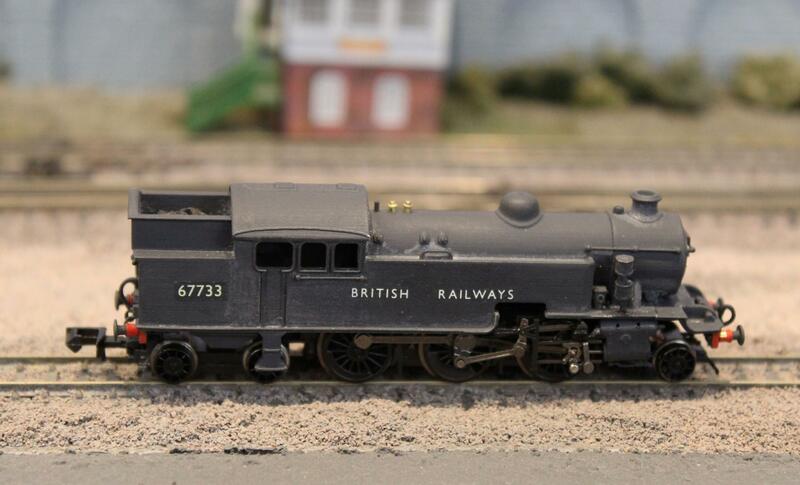 My first experience with Shapeways 3D prints was the Atso-Cad Thompson LNER 2-6-4 Class L1. In order to avoid having to line the loco, I painted it Floquil “Grimy Black” in the hope it would give it a care-worn, weathered appearance. Next time, I will probably paint it loco black, make an attempt at lining, and then weather it using conventional paints and weathering powders. Unfortunately, being new to working with 3D printed models, I did not research the initial step of soaking the print in a solution of IPA or white spirit in order to remove the waxy residue and make the resin opaque. As a result, my L1 is now showing evidence of what looks like a crystalline residue forming on the model. However, in the photos it looks like realistic water stains from the loco’s washout plugs! After hearing that you were going to upgrade and re-release the L1, I had decided to leave my model as is and wait for the new print. I learned a lot from my previous effort and was looking forward to the upgraded 3D print. Please reconsider!! 3D models that I have recently finished include a set of three PALVANS (“Rail 3D Prints”) and two Conflat L container wagons each with 3 limestones containers (“Modelopolis”) - like the old Tri-ang model. For one of the Conflat L wagons I used the kit available from N-Brass Locos but for the second one I just used an unmodified Graham Farish Conflat wagon. My current 3D projects are an Atso-Cad LNER/BR 2-6-2 V3 and a Tyneside Electric LNER single luggage motor coach from Recreation21 (“rue-d-etropal”). The V3 has received an initial coat of grey primer and looks very good so far. The surface is much smoother that it appears in the attached photo. 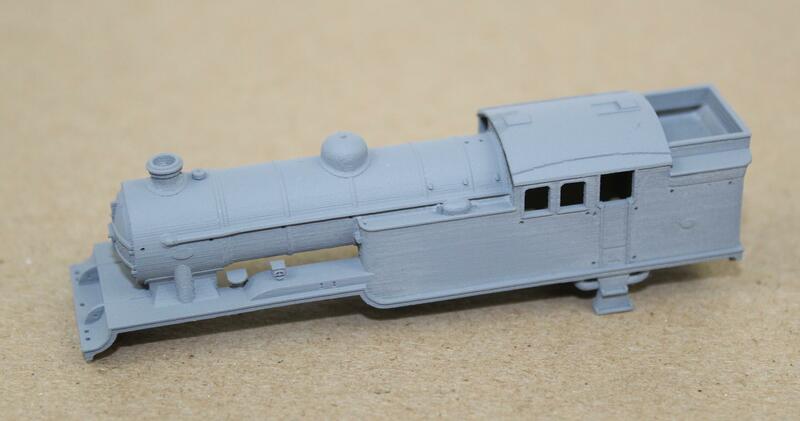 I also like how the model includes a separate print for the cab floor (I had to make a cab floor for my Thompson L1). Also, the rear bogie/truck chassis can be purchased separately which I think will makes things easier but I have not progressed that far yet. Another thing that is much appreciated in the Atso-Cad models is that the locations of the hand rail knobs are indicated by small pin-prick indentations that makes drilling of the holes easy and accurate. These indentations can be seen in the photo of the V3. c. Modifications required to fit the chassis to the body (if any). I think Steve’s articles entitled “Getting Started in 3D Printing” in the Spring 2018 issue of BRM and “Making the Most of 3D Prints” in the May 2018 BRM are a very good introduction to making good 3D print models and good publicity for the 3D industry. But realistically, even good models need promotion and advertising - just look at the number of advertising pages in the monthly magazines. This is obviously not possible with small manufacturers as it would push up prices but it does illustrate the challenges of making a return from such a business. In conclusion, Steve take care of yourself and realize that you have a loyal (but apparently small) band of followers that are very much looking forward to your next models (whenever it might be). Remember how long modelers have to wait for the promised Graham Farish and Dapol models! Hopefully, the refurbished LNER L1 won’t be too long! I forgot to mention in my previous post that the Thompson L1 was motorized using the loco chassis from a GF Ivatt 2MT 2-6-0 loco. The rear driving wheel with the traction tyre was replaced by a new driving wheel for the 2MT (without the traction tyre grove) from the Bachmann Service/Spares Department. The L1 rear truck is a GF front bogie from a B1 loco supplied by BR lines. 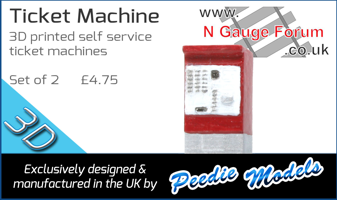 I don't actually think there are enough active N Gauge kit builders to make it possible to earn a living doing it. Not only that but you inevitably compete with those who do it for fun. All the money is in OO (because of the volume) and O (because of the money). Just look at a n O gauge show car park and an N gauge one.. it's enlightening. Genuinely interested by what you mean, nicer cars at an O gauge show? It certainly stands to reason that only those with more disposable income will be drawn to O. For every person in N who does spend hundreds without really thinking about it we have 5 people moaning that the new Farish releases are too expensive. O is never going to be 'cheap', although of course most will only have a small roster comprising few, more expensive items.